We spend a lot of time on this blog waxing poetic about the importance of optimizing your landing pages. But landing pages are only one element of a stellar, high-converting marketing campaign. And focusing all of your attention on optimizing only one element is just foolish. ‘Cause — pardon the cliché — but a chain is only as strong as its weakest link. If you’ve optimized your landing pages and you’re still not getting the results you wished for, maybe there are broken links elsewhere in your conversion chain — like before and after the landing page? Not sure? 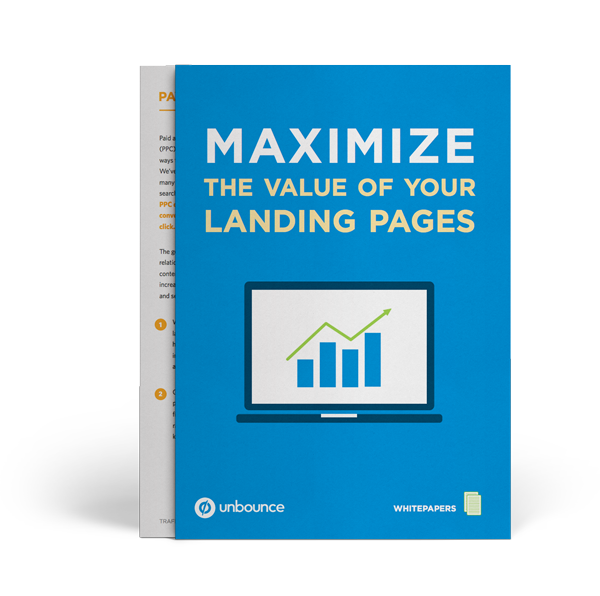 We created a 24-page guide for Unbounce customers to help them maximize the value of their landing pages, but we like you too and figured you might find it useful — regardless of whether you use Unbounce to build your landing pages or not. Before the landing page: Are you doing enough to send healthy doses of traffic to your landing pages? Are there distribution channels you’re missing? How can you use each most effectively? On the landing page: Are you making the most of that sweet traffic by constantly optimizing every element of your landing page for more conversions? After the landing page: After people convert on your optimized page, are you making their next step crystal clear? Are you missing additional conversion and nurturing opportunities on your thank you page? Are you optimizing your entire conversion funnel? Download this 24-page whitepaper and learn how to better optimize your entire conversion funnel -- both before and after your landing page.